Situato nel centro della famosa Kaanapali Beach, questo ben arredate 960 piedi quadrati più Lanai una camera da letto (2 regine in questa camera da letto) + una seconda camera da letto più piccola (9'x9 'con un letto matrimoniale in questa suite} vista giardino può ospitare comodamente quattro adulti o una piccola famiglia. Attrezzata con cucina e lavanderia e due bagni e un privato, vista giardino Lanai. Sia soggiorno e camera vanto di vetrate e arredi isole affascinanti e decorazioni. Il complesso Maui Eldorado dispone di tre piscine e una cabana spiaggia privata attrezzata con asciugamani, cucina completa, e mobili da giardino. Nice stay with good amenities. The condo was a good size and clean. My favorite part of the condo was the lanai. In the morning there were birds chirping and watching you eat. The washer and dryer were a great thing to have. The kitchen was stocked with almost everything you could need. We only cooked at the condo once and we had everything we needed. Outside on the lanai there were beach chairs and a closet with a bunch of stuff for the beach. I was pleased that I didn't have to buy any pool noodles. The staff at the front desk and down at the cabana are amazing. They had a bunch of suggestions for things to do and places to eat. My only had two issues, in the master bedroom the beds were firm and the pillows are flat (probably need new ones). I would wake up sore and stiff. My brother and his girlfriend shared the other bedroom which has an accordion door, so no AC got in there and would get hot a night. I would definitely stay here again. I would bring my own pillows and extra toilet paper (LOL). Daily house keeping isn't part of the rate so we had to buy a few things, I would bring it from home due to prices in Maui. Or I would suggest going to Costco after you land. The prices are reasonable. Last but not least. I didn't see any bugs in the condo or really even outside the condo. Exactly as it looks and just as described. everything we needed! The owner was also super awesome working with us to get a late checkout when our flight got delayed late. Thanks again we had a magical time in paradise. The area was great. Private beach and cabana. One bedroom was large. The second bedroom was very small and no closet. Great location to beach and to shopping. The place has everything you need, even beach accessories. Gilbert was easy to work with and the staff at Eldorado were welcoming. We loved the condo and would definitely stay again! 2-bedroom, 2-bath condo was perfect for me, daughter & son-in-law. Eldorado was well maintained with beautiful grounds, golf course and 1-large pool and area for grilling and eating (which I loved) and 2-smaller pools. Cabana and beach accouterments were readily available for time spent on the beach which was just a short walk or shuttle ride. I spent my time reading under a beautiful tree which offered me shade but still time on the beach. Excellent response time from owner, Gilbert, on any questions that I had. My stay was indeed a vacation. Loved it. 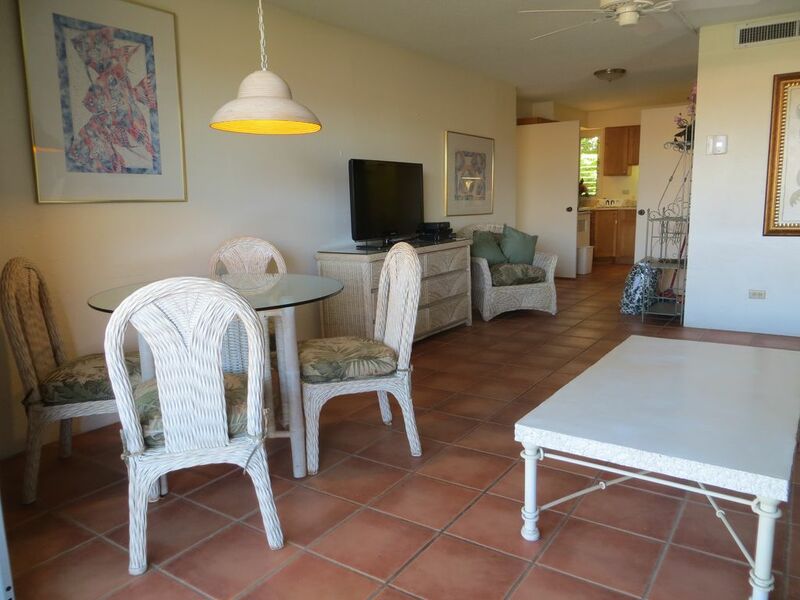 Our group of 5 enjoyed our first trip to Maui in this condo. Although a little dated, it was clean, comfortable, quiet, and in a great location. We enjoyed walking the path to the beach and the extended beach walk. Fish and turtles were found snorkeling around Black Rock from the beach by the Beach Cabana. Having a covered parking space under the pool deck to help keep the car cool was also a plus. We had an issue with the walk-in shower handle on Friday afternoon and had to work with the bellman to get the water turned off, which was a little frustrating, but the repair was completed on Monday once the part was available. I read in other reviews that the first bedroom gets stuffy. This is true - there is no air conditioner vent in this room. The ceiling fan helps, as does keeping the door open, but it would have been nice to have a pedestal fan to help blow cold air into this room from the hall. Overall I would say we definitely got our money's worth and would consider returning to this condo on future vacations.